The Parnell Train station has been delayed once again and is now not due to open till April 2015. 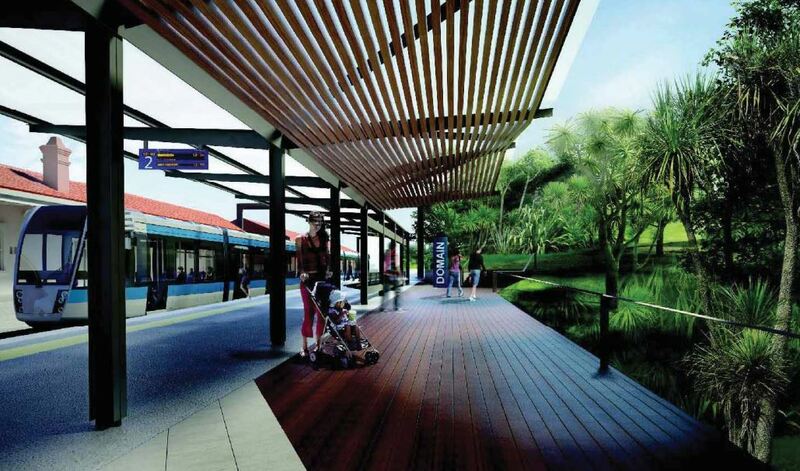 Auckland Transport has given no explanation for the delay which was announced to a special council committee dealing with the station and its impact on the Domain. The last time the committee met was back in 2011 before major works were undertaken to re-grade the tracks through the area to allow for the station to be built and this meeting was to start the process of sorting out pedestrian access from the station. Here is the executive summary of what was presented. 2. This Committee was established to make decisions as landowner about works on the Domain relating to the Parnell Rail Station. 3. 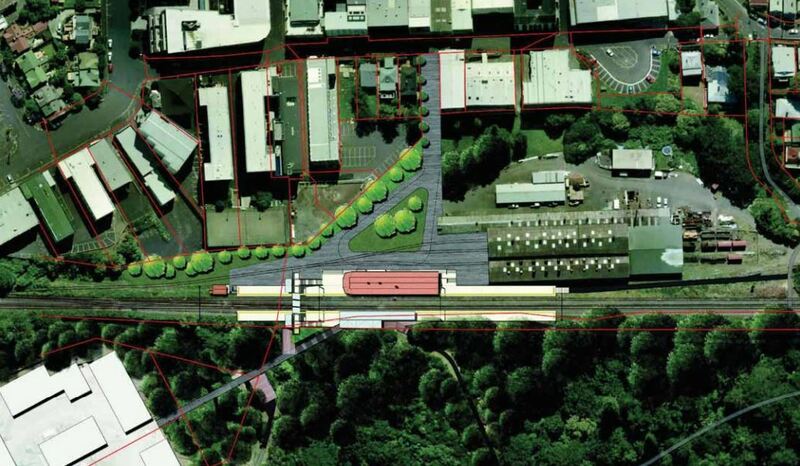 At its meeting in November 2011, this committee approved 2954m2 of Domain land to be set aside for enabling works and the future western platform for the Parnell Rail Station. The Committee’s approval was subject to conditions, including New Zealand Railways Corporation and Auckland Transport entering into an Access Agreement with Auckland Council. 4. Enabling works were undertaken over the close line period in December 2011 – January 2012. Additional works for the pedestrian underpass, planting and pedestrian realignment on the Domain was undertaken during February – September 2012. 5. Construction of the station was intended to take place during December 2012 – January 2013. Auckland Transport expect that the majority of works will now take place in December 2014 – January 2015 with the station open by April 2015.
location as indicated on drawings presented to the Committee in 2011, but details of connections through the Domain were not defined at that time. 7. Auckland Transport proposes three new connections from the western platform through the Domain (refer Attachment A). Each connection provides the opportunity to access different parts of the Domain and recognises that they serve different functions. Route 1 (‘woodchip yard’) is the most direct route to the main part of the Domain. Route 2 (‘Watercare access road’) can be made fully accessible and provides access to the Tennis Centre, University and to the main part of the Domain via Lower Domain Drive. Route 3 (‘Carlaw Park’) opens up a part of the Domain that is largely unused and provides access to Stanley Street from Carlaw Park Lane. 8. Details of the structures will be presented for consideration and approval of this Committee by September. 9. Auckland Transport has requested the opportunity to make a presentation to provide the Committee with an update on station design and consultation which will follow on from this report. The report attached to the agenda goes into how the three routes proposed above were chosen. I think it is really disappointing that this station has once again been delayed again as it has a huge amount of potential to really help boost patronage by providing a station in an area with a lot of activity. In saying that I still think the station is in the wrong location and as such doesn’t make the best use of its potential. I feel it should be about 200m further north with one end providing a connection to roughly the intersection of Heather St and Bedford St, instead putting more weight on having a station next to a bush clad gully. As this map shows there is very little connection to the north of the station to the commercial and residential areas around The Strand. At the meeting Auckland Transport also gave a presentation in which they have showed some new images of what the station may look like. First up is the top down view of the concept design. And now time for some pretty graphics, here is the design looking north. And looking from the platform down the proposed extension of Nicholls Lane which would provide excellent access to the business park at Carlaw Park as well as to the University using the new pedestrian and cycle path up through Grafton Gully. And lastly from Nicholls Lane looking up at the station. All up it looks like it will be a very unique station, just as shame it isn’t a little further north to provide even greater pedestrian connections. I don’t think the delay is too bad – only electric trains will be able to stop there (well, only electrics will be able to get moving properly uphill after stopping there) so to me it makes sense to hold off until at least two of the three lines that will use Parnell are electric (being Onehunga, Southern line services). Another disappointing, but entirely characteristic decision from AT. I’m not a conspiracy theorists but it’s almost as if they don’t want passenger numbers to grow, perhaps thus giving the National party administration the excuse it needs not to proceed with the CRL. 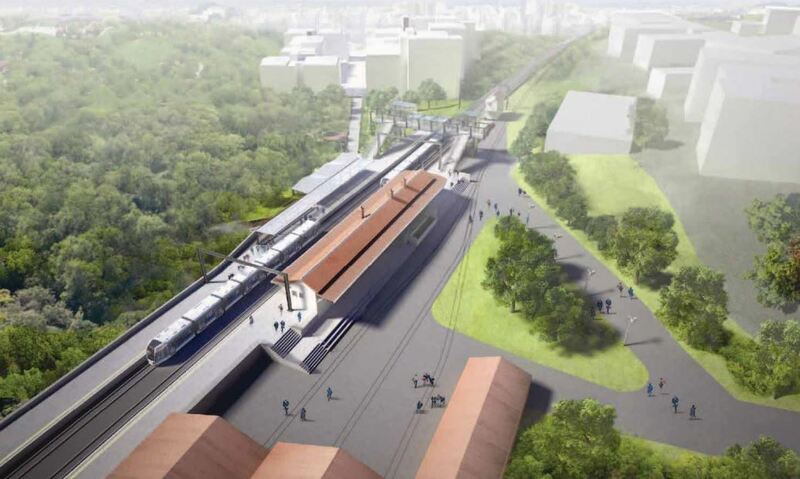 As a Pedantry Corner aside, I note that, once again, AT doesn’t seem to be able to brief the artists it employs as to what the EMUs that will be using the facility actually look like; like the dreadful render of Aotea station they produced some time back, the trains look like light rail vehicles. I wondered how long it would take for someone to bring up the look of the trains. I assume it was what was available in the package the artist used. Sure but they could at least use “AT colours” on the damn models! Looks like a beautiful station; I especially love the design of the Domain side. I’m confused by the tracks going to the Mainline Steam buildings in the concept drawings. Are they still going to be there? Or is that just to help you get your bearings? Because MS are moving from the site, yes? The Domain side though looks like a significant security worry at nighttime. It is in a gully and surrounded by bush, hardly a combination calculated to encourage use by single people after dark. I hope it is well lit and monitored by CCTV, although in order to preserve the beauty of the design view they appear to have left out the lighting that MUST be there??? MLS are staying, so those tracks will be there. There will be fewer tracks though. Earlier drawings showed a new track around the eastern side of the building, to replace the existing track around the western side (which needs to be lifted to make way for the new platform), but the new drawings don’t show this. Also, disappointing to see the overbridge has been cut short, instead of providing a level walk toward the street at Parnell. It looks like they now want people to go back down to ground level, then walk up the hill to the street. A bit silly, especially as it will create conflict between pedestrians and any MLS train movements. Oh, really? So those steps down on their side will going right to their doorstep? How strange. But ok, thanks for clearing that up. Must say I agree about the overbridge too. I agree too. one of the things that would’ve made this station even more unique would’ve been an overbridge from the domain gully right over to Parnell Rise providing a direct link between the two.. 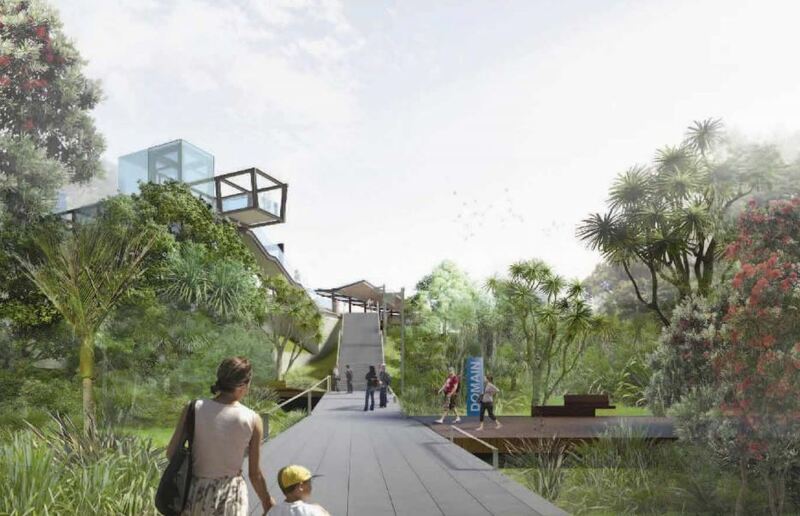 It would be fantastic to not only have a level walk to Parnell Rise, but to be able to walk from the bridge straight into the forest canopy of the domain. And the view from the overbridge would be fantastic as well. On a positive note, I do like the wood panelling in the design. Matt, as you know I disagree with you about the location and that this station should be geared towards uni students. By all means have access (as there will be) for them but this station is for the local Parnell community, and they and their business association have been the ones pushing for this as several pieces in the media have attested. It is disappointing it’s been put back again. Once is ok, but this is what, about the third time now? Those renders are gorgeous. Is that the new standard? I think a lot of uni students would use this station instead of going to Britomart or taking the bus. 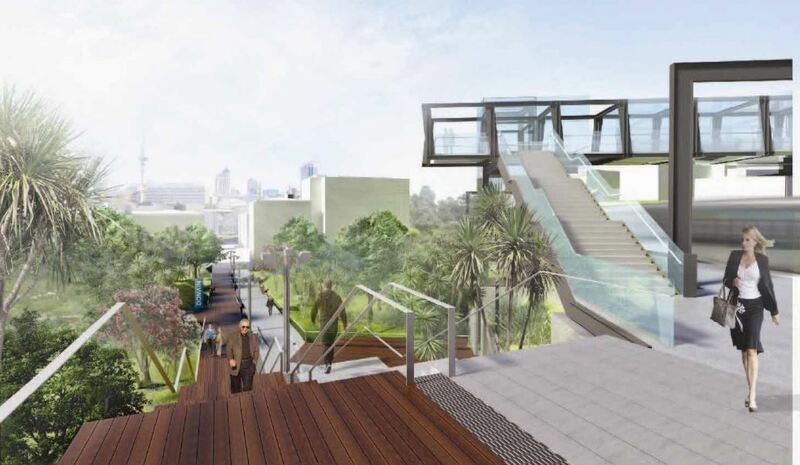 Although a pretty pedestrian overbridge over Stanley St would be good too. I’m in a similar situation. Literally adjacent to the old Strand platforms. I understand why they don’t use the old station (yet another stop, awkward routing to get trains through it), but the enforced disconnection between this side of the tracks and the Vector side makes rail impractical for a lot of people who work in Parnell because it’s such a long extra walk to get around the tracks. With this additional delay, the least the useless sods can do is build a bridge. The decision not to have a station at Vector really was shite. What a poor effort in planning. The Eastern Line doesn’t actually pass those platforms though. None of the lines pass them. Yes any train going to or from Britomart cannot stop at those platforms, not without some seriously awkward shunting back and forth at least. A better option would be to add some new platforms to the eastern line, somewhere between Quay Park Junction and the Strand overbridge. I once came up with this concept for Strand platforms to free up Britomart berths from having to accommodate the then-Overlander while also providing metro access from Britomart to longer distance services (when Huapai and Britomart-to-Pukekohe services looked more likely). Missing from that render is a small ramp from the eastbound metro platform to the carpark and onward to Quay St. However that predates recent changes to the Strand, its conversion into a stabling facility, assumed the CRL was a long way away (freeing up potential long distance train capacity at Britomart), and assumed Huapai rail was viable (it’s not) – so I wouldn’t propose this now as it is incompatible with these more recent developments. The least AT could do in the interim is to arrange for KiwiRail, or whoever is responsible for maintaining the rail corridor there, to remove the extensive pest plant infestation around Carlaw Park, the proposed station site and the Domain embankment. That is one mighty fine looking station and in quite a good location with various businesses and the tennis centre just around the corner. Yes it is looking very good. Its a fairly good location, but I think it could have been better further north. They could have put it right between Carlaw Park, Parnell, the Strand/Beach Rd area and the University, rather than right between the Domain and Parnell. I can’t see the back end of the Domain generating much use on a day to day basis, better to locate it a couple hundred metres closer where people actually live and work. True, but moving it north would have made it more into a boxed in congested station unlike the proposed spacious one. The current proposal make for a very nice link from Nicholis lane and puts the station in a more desirable pedestrain walking path that could help drive retail development on the side and back streets of Parnell rather than just the main road as it is now. So a little harder for current train passengers to walk to but better for the growth of the area I’d say. The university precinct generates many thousands more source/destination pairs than Parnell ever will, so siting the station closer to the university area is of greater benefit to more people. Or are you one of these people whose response is “Let those good-for-nothing bums walk”? Based on my measurements the proposed location gives students a 500m walk to the station, and alternative location by the rail bridges would give them a massive 50m(10%) reduction which I doubt would make any difference what so ever. I would much rather place the station in a location that best serves the area it is in well into to future rather than reducing the walking distance to one select group of uses where are on the extremity of the station catchment by 10%. If the university had 100,000 mobility impaired students we could look at putting in a bridge or something, maybe a shuttle to britomart. As it is I think the students fit within the mobility capabilities of the rest of the general population. The satellite site is actually 5,500m2, which is a greater footprint that they have indicated by mainline steam. I think it’s also a better position as it would be elevated overlooking Carlaw Park with views across the Stanley St valley, rather than being in the bottom of a valley (admittedly pleasant and green). I’m not sure about the ability to drive development in the back lanes, those lanes are very steep and constrained with a dog leg path. Maybe it will happen, but I would have rather seen the main route along the shorter and less steep path up Heather St. There is a lot more potential for Heather St to be opened up to retail and cafes than the back lanes, not least because it is sunny. I’m not super concerned with Uni students myself, although the closer the better. My bigger concern are the areas around Stanley St, Parnell Rise, Augustus Terrace, the Strand and Beach Rd. That bit is ripe for intensification and redevelopment in a way that the other end (i.e the domain, Gibraltar Cres and Birdwood Cres) never could be. I guess the key point is that the Mainline Steam area and Cheshire st would still be nice and close to a station in the more northerly position. I just can’t help but feel that with the mainline steam site we are making 80% of the potential users walk 300m further up the gully for no reason. If the station were further north with an entrance on Carlaw Park Ave we wouldn’t need to add any shuttles, people could simply hop on one of the two link routes that run on Parnell Rise a mere 50m away. One of those links goes straight to the University then midtown, the other along Beach Rd to downtown. 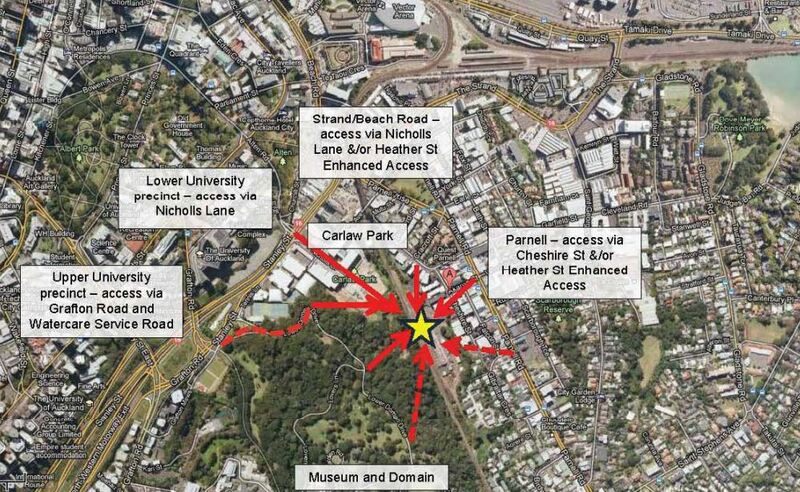 I completely agree, it seems like common sense to place the station at a higher point closer to Parnell’s shops & offices.. To get to the Auckland Uni, students would be better to traverse the domain, rather than skirt around the bottom of it through Carlaw Park. Mainline steam should go to Motat, or to the old railyards by Vector, if they wish remain local. I do enjoy old trains but that site is far too strategically (and economically) valuable for a museum. Not related to this station, but related to trains, why the hell is Newmarket a fare stage boundary for the Southern Line but not for the Western Line? Remuera is considerably closer to Newmarket than are Kingsland and Mt Eden, but the former is two stages to Britomart while the latter two are only on stage. That’s ridiculous! Because the fare stages for trains are aligned with the bus stages, both of which are based around the CBD. Kingsland is closer to Britomart than Remuera is, as the crow flies (or as a bus would drive, if there was a bus that did that trip). If AT decided that Western Line customers, in addition to being delayed by taking a roundabout route via Newmarket, would also have to pay extra for the privilege, now that would be ridiculous. So it’s ridiculous to use a distance-travelled metric instead of a crow-flies metric? Riiiiiiiiight. Roll on a sensible fare system, and the sooner the better! Yes I think would be ridiculous to use a distance-travelled metric in this case. It’s not western line passengers fault that their service goes sideways through grafton, backwards into Newmarket, then hooks around the east side of town to get to Britomart. I don’t see why you would want to charge people more for a slower trip over a shorter distance. Agreed, it would be rather strange for it to be one stage on the bus but two stages on the train because you get to go on a scenic tour through Newmarket. I suspect western folk would be equally hard done by if they get charged to go on a 10min detour through the CRL rather than their current 2min trip to Grafton or Newmarket. SF: aye, I’d hope that they’d be charged based on where they finally get off, whether they ride right around through the CRL, Britomart and Parnell, or change at Newton. That’s how you expect a zone system to work. Yes so similar to how the current system works, so the fact your train needs to take a detour is irrelevant. Not quite SF, I think Steve is saying that people should be charged for their origin and destination, regardless of whether they get off at Newton Station and Walk, or get on another train to Grafton. Yes, it is ridiculous. No-one cares about where the tracks run, or where the intermediate stations are. The service PT provides is being a magic portal that takes you from Station A to Station B, and the distance between those two is the only important distance to care about. But that’s a philosophical difference. But there’s a very concrete second issue that I pointed out – buses. A sensible fare system is going to make sure that fares from Kingsland to the city centre are the same whether you travel by train or bus. Our new zone-based system will do that. Based on the maps in the RPTP, it looks like AT wanted to solve this by having the same two-zone fare from anywhere in the isthmus (including both Remuera and Kingsland) to the city. Is there going to be any upgrades to the streets in Parnell around the new station? Some shared spaces between there and Parnell Road could be nice; otherwise the pedestrian routes to the station could be quite unappealing. You would hope so, there is plenty of good stuff in those images about links to Carlaw Park and the Domain, but the path up to Parnell Rd is a bit of tortuous dog leg up some steep back lanes at the moment. I do hope they are looking at some improvements. Dam Dam Dam. Why? I’ve been waiting for sooooo long to see this started. I look at the Main Line Steam building from my office. That proposed station is being waited on by the whole office to take us into Britomart for my promised Friday night drinks. Talking about the Strand station, I would use that for my commute as I come from Glen Innes. I think at least until the electric trains arrive it would be a fairly testing platform to stop at for most of the current fleet and overall add several minutes to a trip in any direction (and that is untenable going to and from west especially). That may well have a lot to do with the delay. I agree the station would benefit from being weighted a little further north, and a whole lot of attention being given to stimulating development of the whole eastern side of this valley, currently almost entirely given over to car storage; that shittiest of land uses. It is also my view that Mainline Steam is not the best use of those sheds and that site. This sort of valuable historical preservation work ought to take place somewhere with much less inherent land value to lower its cost base and allow the Council to upgrade the sheds to Parnell market value and lead the regeneration of the whole valley. It’s a beautiful valley and will be even more so once the smelly and noisy old diesels are no longer struggling up the hill. The birdsong is lovely and it could become a real destination, and walking riding link to Newmarket (through disused tunnel) and the Domain. It deserves more life and people, which will also go a long way to solving any security issues, along with good lighting and design. The delay is disappointing but it is more important that it is done well. Huge potential here. A beautiful valley more than neglected. I like the all wood on the platform and the overhead structures. Railway station platforms are typically big lumps of concrete. The wood seems like a typically Kiwi material to use. And the bush encroaching on the platforms and the walkways makes me think of jungle rather than public transport, where you might see a colourful parrot perhaps. Station platforms within the fall zone are actually asphalt, which is an insulator. The exception is Kingsland which is concrete (conductive) – I’m not sure what is planned to correct that; presumably an asphalt overlay. But I agree that timber (also conductive when wet) beyond the fall zone is great although it would need to be a hardwood for durability, so not a NZ timber. or at least not a NZ timber that you can legally mill ;). Totara would be great in such environments given it’s weather resistant properties, but alas we’ve already cut most of it down :(. I would be interested in the patronage estimates and peoples destination (ie Symonds, Uni, Anzac, Beach rd, The strand, Ponsonby). If enough people used it for those destinations then some trains may not even need to go into Brittomart and could conceivably use the through lines at the old station to head back east, also vice versa to take people out of the city. That would be nice, you could walk to Parnell Baths and Judges Bay! From trains in both directions. CPTED (Crime prevention through environmental design) considerations? Cycle Action Auckland has tried various times to provide input to the project team to improve the cycling access for this station, and through this station area, west-east – sadly, the southern underpass was built without invlving us, and its a bit doubtful how a cyclist should in the future cross west-east across the rail station here – no bridge ramps! Seeing that this route is on the approved Waitemata Local Board Greenway from Newmarket, through the old Parnell Tunnel, to Beach Road, this is a bit disappointing. Maybe this delay will allow something to be incorporated. Though if using the re-built underpass, the path will have to skirt the edge of the Domain on the western side of the rail line for a bit and probably remove a few trees in the Domain, which could be difficult to achieve permission for… sigh. What a disappointing result. You would think cycling would be getting slightly higher on ATs agenda now. Two steps forward, one step back in Auckland. Just a question. Have you seen, and if so do you use cycle push ramps. For clarity why they are is a little half round channel next to steps that looks like a drain but is actually meant to be for cyclists so they can push their bikes up the stairs rather than carry them. Obviously not as ideal as a ramp you can ride in but it could be something of use for cyclist who use the train. Are there any good examples in Auckland? I’ve used them plenty overseas but I can’t recall coming across them here. An example is on the Oakley creek cycle track coming down from Great North road. However that path in general is a good example of how not to make a cycle path. Are you talking of the path that runs along Oeakley Creek (NOT the one that runs along Great North Road) from near the culvert near the motorway interchange? Going into the bush to the south of the ped/cycle overbridge? Well, that path was never designed as a cycleway, and is way too narrow. I would not advocate for anyone riding there, not even at walking speed. And Friends of Oakley Creek would probably object to it being widened sufficiently to be used as a cycleway – but then the future Waterview Cycleway is coming, and cyclists will have even less reason to consider the existing path down in the ravine. Pt Resolution bridge also has them. Hi SF Lauren – CAA is certainly aware of cycle push ramps. We have been championing them around Auckland for years now – though they are often rejected, sometimes on dubious grounds. The first example which seems to have worked out well (I haven’t used it myself yet) was the one at the new bridge at Parnell Baths. However, the point I was trying to make was that AT re-built the underpass, actually arguing that they widened it to also benefit cyclists – yet on the western side of that underpass all paths have steep sets of stairs up to the Domain paths. It would be so much better to be able to connect that underpass to proper cycleways on both sides. Yet while we have good connections to various parts of AT and AC, the project team for Parnell Train Station has never engaged with us, except after the fact (and not since). We don’t want this opportunity (or the investment into the better underpass) to be lost. I have used the bike ramps at Pt Res bridge (next to Parnell baths) once.. works really well. Why wouldn’t you include them practically everywhere? Like in several Europe countries, e.g. crossings above / below railway lines or major roads, esp in town centres where there may not be space for ramps. Looking at the last image for example, that should be cycle-able right up to the steps which should have ramps and maybe bike storage on the platform or somewhere secure nearby.. there looks to be heaps of space for it. Fantastic station design, love the wood and glass and the dark steel boxes sections. Sounds like we have 3 of us, maybe 4, in favour of cycle push ramps. Time for us to send in our proposal to make sure it gets into the design given we have plenty of time right now. perhaps needless to say, but 1) such cycle ramps are common in Netherlands and very useful and 2) would indeed seem to be a no-brainer for improving cycle access on stairs. Yeah on second thoughts maybe we need to do a few more years research on kiwi bike ramps, like we’re doing with the drink driving limit.. I am thinking they use this word ‘trial’ to get around funding constraints. Even Moscow & Belgrade street underpasses have these ramps! I have an email from AT about the use of Dutch style intersections as being ‘trialed’ in Chch. They refuse to build any of these until their effectiveness has been proven in the Chch example. Why? They work in NL and the only difference here is that we drive on the other side of the road. To be fair to AT, some of the most significant objections to cycle push ramps came from acessibility groups worried about how this would make stairs less useable for blind and mobility-impaired people. CAA pushed for (and somewhat succeeded) to organise joint CAA-AT-Mobility Group meetings to discuss their concerns. Now that we have some examples of cycle push ramps around Auckland, we hopefully can test these in reality and lay to rest any remaining concerns (or modify the ramps if there’s still concerns). Yes, putting this further north would give the chance to develop the Strand as a major employment destination. A loss, really. The Strand is one of the countries most important freight routes and so unlikely to start having big office buildings poping up along the side or it. I’d say NZTA would not be keen on adding more more side friction and would rather take it away. Something else to take into cincuderarion here is that Parnell is unlikely to remain unchanged for the next 100 year’s. More likely you will see more of what is currently happening, i.e. lots of total redevelopment. There is a shedload of width in the Strand corridor, not to mention a couple of huge reserves to straighten out cuves. Putting aside NZTAs long term (and very unrealistic I think) proposals to trench or tunnel the motorway through to the port, you could very easily rebuild the Stand as a proper urban boulevard with through lanes in the centre and slip lanes for local access. More than enough width for an uber freight corridor in the middle while still having a busy street alongside. Are you referring to Stanley st or the strand? Looking at the strand it doesn’t look to have too much redundant space at all. There are a few little pockets that could be used to shove a few town houses in however I don’t think the road has much of a chance of being an aesthetically pleasing route for offices and cafes. I would say your more likely to get an outdoor cafe on the footpath of fanshawe st than you are here. Maybe if NZTA did a cut & cover tunnel but you would be spending a few hundred million for that. I mean The Strand. The corridor is a minimum 33m wide between building lines from Beach Rd to Tamaki Dr. You can see the reservation for the curve easement near the intersection with St Georges Bay Rd too. It’s got a heap of berms and open parking lots, I consider that basically redundant. If you are happy to remove a row of the leasehold terraces next to Ronayne St, the Juicy car rental office, some carparks and the panelbeaters at number 45 (which you would if you’re talking about a proper urban avenue being rebuilt to have large buildings and a strategic traffic function) then the corridor is 45-50m wide. The rail bridge main span is 45m wide so that would be an appropriate limit to take. I’m sure you could do some pretty big things with a 45m cross section, no? Like you could fit Te Irirangi Dr in there, but with more side lanes and less planted median. Stanley St is currently more constrained, however all the buildings down the western side are owned by NZTA and earmarked for eventual demolition anyway. The buildings on the eastern side are pretty good so you’d keep those and widen to the west, creating a new frontage to be built along. I’m not suggesting particularly outdoor cafes, more like intensive offices and service industries. Not everywhere has to be a chic lane with restuarant tables along it, but I think everywhere can be better than the panel shops and storage king outfits that currently operate on The Strand. So maybe land use like one side on Carlaw Park Ave, or something like St Kilda Rd in Melbourne. In fact Fanshawe St on the north side behind the Viaduct harbour might be a fairly good indicator, although I’d prefer to see separation of through and local traffic with actual local lanes that could support local access, cycling, parking and other high friction uses (The Strand is quite interesting because its probably the one major urban arterial you’d never need to run PT along, which is quite beneficial really). The cut and cover tunnel is exactly the thing I’m trying to avoid, largely because the last cost estimate I heard was around a billion dollars. It would be VIc Park but wider and two or three times as long. Well yes the area does have potential to be more than a vehicle testing station, I’m just saying that if I was wanting to buy an office building to promote the happiness and wellbeing of my staff I would much rather have one located in the middle of Parnell next to the domain and a train station rather than in a hole between a retaining wall and one of New Zealands busiest freight routes. For reference, an upgraded normal road through there would be about 30m in width providing for large trucks pedestrains and cyclist. To add a road side service lane you would be wanting another 8m and if you were to go round the back of the buildings about 10m. Both the above assuming there is no on-street parking. If The Strand was made up of 2 x single lane service roads (one way) and a 2 x single lane road for general traffic, traffic would flow much better, The 2 into 1 half way along is a balls up to put it mildly as no one seems able to merge without virtually stopping. I should have clarified; I mean the area bounded between the university, the stadium, and the bottom of Parnell. I think of it all as The Strand, though that’s not necessarily accurate. This station will accelerate development in the area, but not nearly as much as a well situated one would. I would hope there would be a path heading north along the east side of the rail-line too, connecting to Parnell Rise via Bedford or Mutu streets. Also don’t like the look of the giant access road heading down the hill to the station. Looks like is designed to encourage pickup/drop off, not ideal. Needs to be bollarded, and make it a nice wide walking access route. Agree should have been further north, rather than inline with the south end of the Parnell shops. The shops have few jobs, and attract visitors but minor drawcard really, and much better served by the very legible Link bus. Lots more jobs and job potential arounds Stanely St, the Strand and southern part of Beach Road. Big issue is still the legibility from the Parnell shops. Will need big advertising campaign, and big signs on Parnell Road to help people find it. Cheshire St is also extremely poor and needs alot of work. Tiny footpath on West side only, and dominated by huge garages. Terrible pedestrian space and very difficult to fix the Urban Design issues. Mutu Street – whoever decided to make that passageway into a “street”? It is ridiculous to make that a through road. I don’t mind this position because its close to the Parnell shops. If the station was further north it would deposit people at the bottom of Parnell rise and they would need to walk uphill. I like the bush position too. A northern position would mean an at grade walk along Heather St, and station clearly visible from Parnell Road. That’s what you do streetscape upgrades for. I think the point is that most people are not as you say heading south, up the rise, but rather are wanting to get to/from the cluster of activity to the north – offices, businesses, universities, etc. I agree its a lovely looking station in a great setting, but the majority of potential users seem to have been inconvenienced in order to justify a pet-heritage project (Mainsteam). Fair enough, but if the die is cast, let’s look on the bright side. It will be a good station for tourists to access Parnell and the domain. You can walk downhill to the strand and uni for work, then afterwork they can walk to britomart. I don’t know the history of the mainline steam thing. I think eventually relocating will be financially irresistible. Who owns the site, a trust or something? I think the Mainsteam sheds are council owned aren’t they? Mike Lee was the one pushing their heritage value (which is fine) and was the real driver to have the station located there as part of that. I think that the old sheds will be brilliant and lend a character to the station that is not found anywhere else. Owned by KiwiRail, and leased to Mainline Steam. Your inconvenience is a grand total of some 50m and comes at the expense of locating the station centrally in the area it caters for. In addition your main complaint is based on the assumption that Parnell will never grow even though it currently is and will well into the future. From my understanding this is a permanent station that could well be there for 50-100 years and so we need to look well into the future rather than next week or 2 years time. Well your 50m must be different than everyone elses, but then that wouldn’t be surprising. I have re-read my post and don’t see any assumption about Parnell not growing – which is probably because I never made one. I know one part of that area that won’t see any growth, and its the Domain, which makes up practically 50% of the surrounding area of that station as its currently planned. Good luck in developing that, even in 50-00yrs time. The new station will be a success on many fronts, of that I have no doubt. But it won’t be the best result because the decision to locate it where it is was not about what was best from a transit perspective, but rather by a desire to see the Mainlaine sheds restored into an alternative use. So be it. As its now locked in, we can try and make sure its the best it can be. The delay is one year, not two. The original plan was track lowering 2011/2012, platform site works 2012/2013 and station relocation 2013/2014, then opening around April 2014. Platform site works have been delayed two years, but actual opening is delayed by just one year. What about escalators up till Parnell rd in a Barcelona fashion? I guess AT/AC are trying to go for the Scalinata di Spagna look! There has been numerous consultant reports on the Parnell Station location done over the years. The best proposal I have seen locates the station bang on the Parnell Rise over bridge with lift/stair access north and south creating pedestrian link across Parnell rise and creating a visible symbol via encapsulation of ‘station’ in a tube flying across this important urban node, clearing away the bill boards that currently litter the site also creating public space behind the hotel on the corner and linking into a development on Shipright Lane, currently parking. Access to Parnell via Heather street, access to university via a pedestrian bridge across Stanley St to Constitution Hill. Any proposal needs to be aware of significant Auckland heritage in the area, the eastern Domain /Parnell boundary was a stream that sill exists in pipes and runs up to Kyhber Pass alongside the rail line and should be day lighted as part of any station proposal. The stream was the reason for a rope factory one of Aucklands first industries locating in the vicinity as well as breweries. Stanley St was the northern Boundary to the public Domain, all the current development on the South side of that road is an encroachment into land that was gifted and held in trust for the people of Auckland. The shoreline was historically at the corner of the Stanley St and Beach Rd and a busy trading node. Waka would often park there. There needs to be processes put in place to ensure connections to that heritage landscape are not overlooked. So the tennis centre, the new apartments, the Caltex etc are all on what was once Domain land? Not certain exact extents, some railway ownership in the area as well but definitely the old rugby league stadium and tennis centre were recreational in nature and thus developed in that location sympathetic to the Auckland Public Domain. Slowly commercial activity has chipped away at the Stanley street edge. Auckland Library has an excellent historic map collection some accessible online.